I love this season, don’t get me wrong I’m sad to see summer go but I love everything about harvest time. In Nova Scotia fall is so bountiful, I swear my grocery bill is cut in half. We have our summer chickens in the freezer, and there is such an abundance of fresh produce available. Bring it on!! 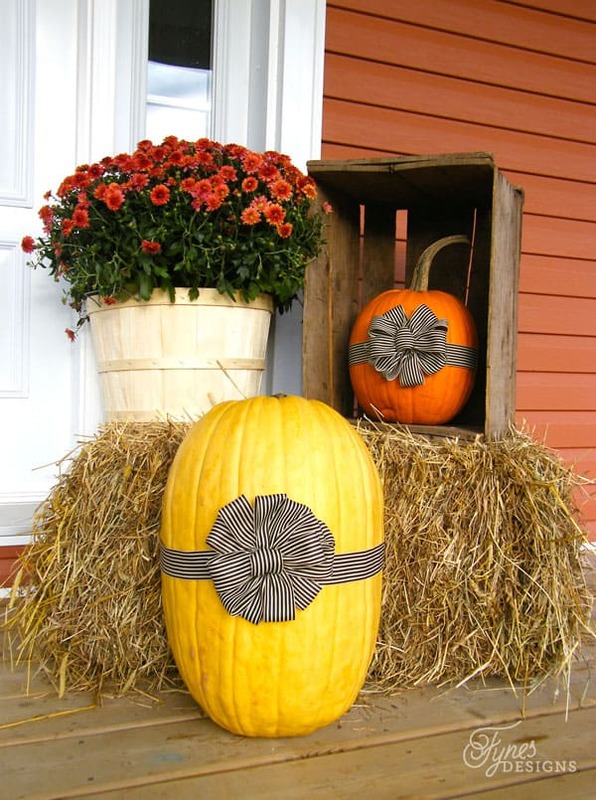 The cool weather of Fall is hot on our heels and since I’m jet setting off to Toronto this morning I just couldn’t wait to get my fall decorating up! I shared how I’m getting my fall decorating rolling outside last week, and now I need to show you what is going on inside! A friend gave me a stack of cabinet doors. 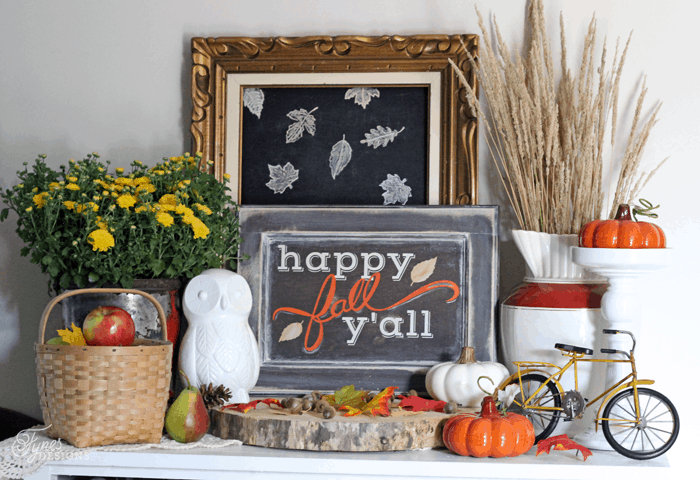 When I painted this ‘Happy Fall Y’all” sign it was the perfect starting point for my fall vignette. I decorated this fall vignette with some seasonal items, like these giant mums I picked up at Costco, apples, pinecones and acorns. I searched everywhere for a wheat field, but it seems as if all that is planed is corn and soya beans this year. I settled for some tall grass, I think it worked as a great substitute! I had to steal my little own from my bathroom to hang out in amongst all these fall decorations. He is pretty cute! I had a few wood slices left from when I painted a wood slice winter sign last year. 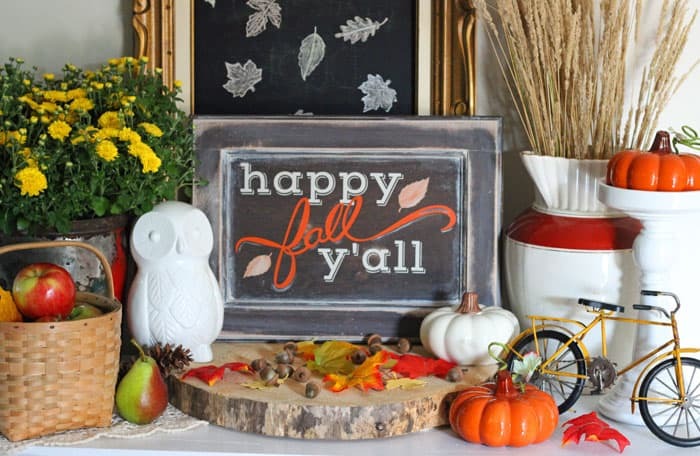 It made a perfect riser for my fall vignette. 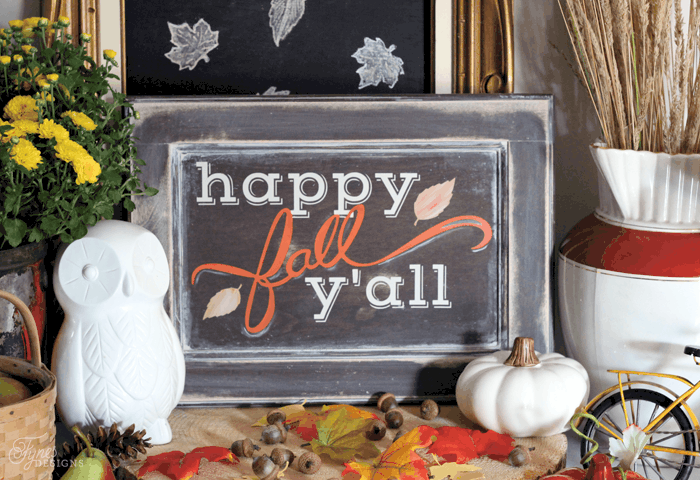 I would have loved to share the cut file for my Fall sign with you, but I purchased the ‘fall’ word from the silhouette store. If you search “Fall Loni Harris” you’ll find it, and the other words are in the font ‘Vast Shadow”. So lovely, Virginia! 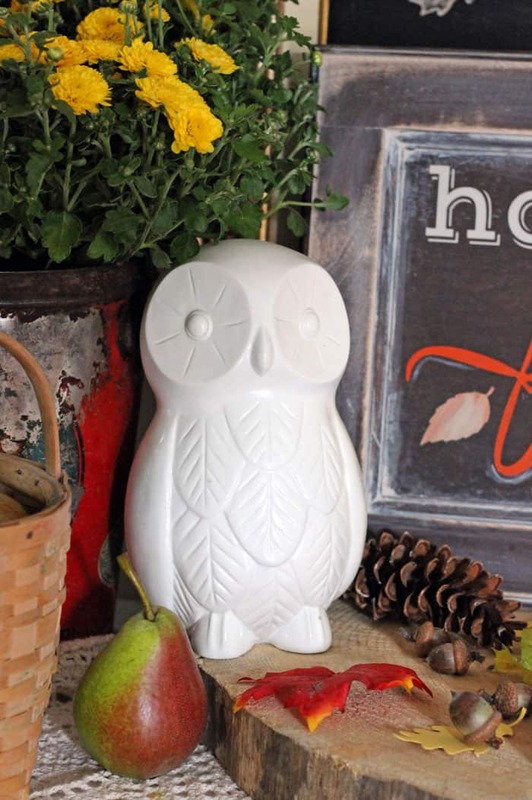 I love that owl! 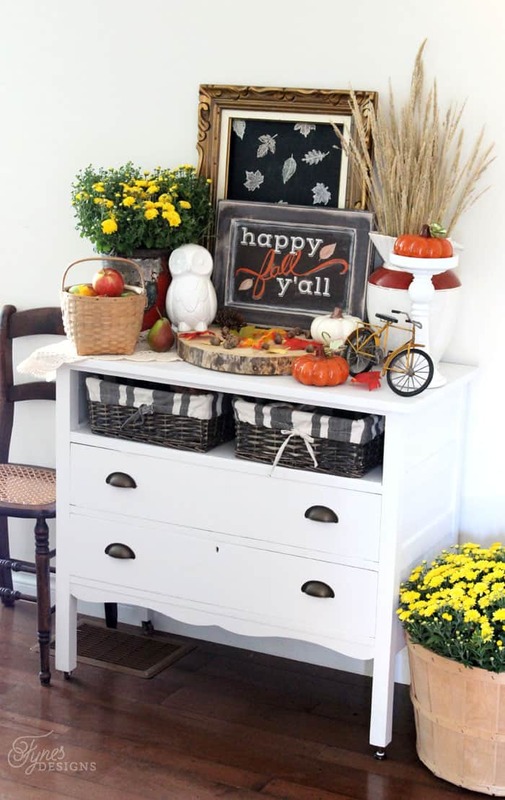 Lovely fall vignette Virginia. It has so many interesting details and is so much fun! I so love your creative style with everything you do! 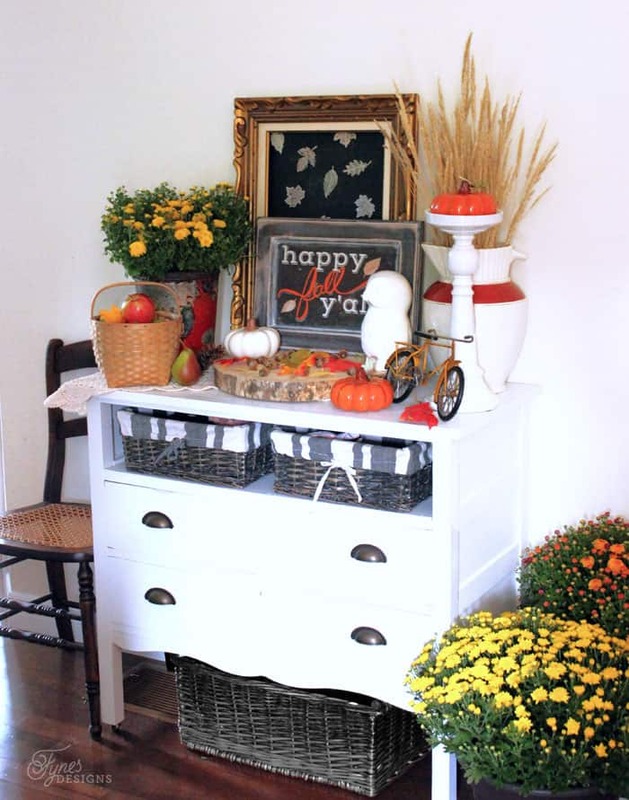 Thanks Thea, I really used a lot of things I had around the house, and added in a few fall elements! Thanks for stopping by! Cute cute! Love that cabinet door sign (seeing those a lot lately – I might have to hit up the Habitat Resale store and try one myself!) and the tiny bicycle is a fun whimsical touch. Thank you so much for linking up… I am featuring you today!